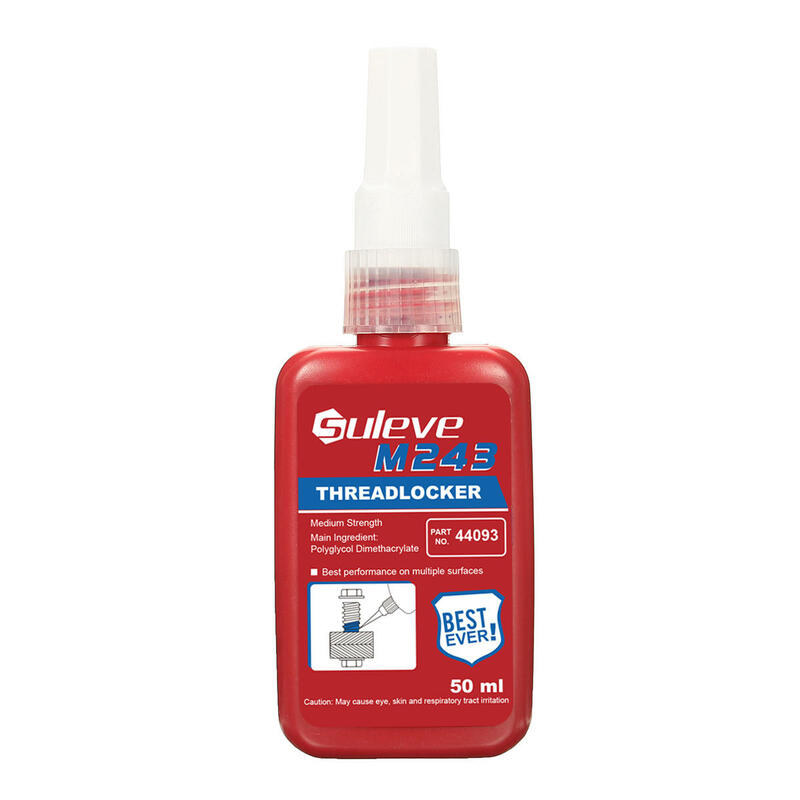 Suleve™ M243 Threadlocker is a general purpose threadlocker of medium bond strength. This threadlocker secures and seal bolts, nuts and studs to prevent loosening due to vibration. The product works on all metals, including passive substrates such as stainless steel, aluminium and plated surfaces. It is proven to be tolerant of minor contamination due to industrial oils, e.g. engine oils, corrosion prevention oils and cutting fluids. Requires heat and/or special tools for removal. ● Prevents loosening on vibrating assemblies, e.g. pumps, gear boxes or presses. ● Works on all metals, including passive substrates (e.g. stainless steel, aluminium, plated surfaces). ● Oil-tolerant curing on as-received fasteners without cleaning. ● Permits disassembly with hand tools for servicing. 3. Assemble the fasteners as usual, wipe off the spilled glue, wait for 24hrs until it fully cured. * Why there is only half full of glue in bottle? There are already 50mL of the product in the bottle, the other half of air is to insulate and prevent the anaerobic adhesive from solidifying. Please feel free to buy. ● Caution: May Cause eye, skin and respiratory tract irritation. ● Safety measure: Store in a cool, well ventilated area. ● Avoid contact with eyes, skin and clothing. Avoid breathing vapor and mist. Wash thoroughly after handling.